It’s pretty difficult to accomplish what your heart desires if you don’t feel as if you are worth it. It’s tough to offer love to others if you feel really cruddy about yourself. It’s almost impossible to be confident and positive if you really don’t like yourself. What can you do today to nurture your soul? As women we nurture everyone else, but not ourselves. Tell me below what you are going to do for yourself today. Me? I just got my heart rate up for 15 minutes. Go me! Now let’s see if I keep with it! Cheer me on. And tell me your self love intentions. Lots of love. I’m with ya, friend! Are You Wearing Your True Colors? Today is my birthday!! I thought it quite appropriate to post this today, since I am entering a “milestone” birthday this year–that of receiving Medicare. Yes, this lady right here is turning 65 years old today!! I can’t believe it. Because I am waaaay too young at heart to be 65!! Right? That’s what living with gusto and passion will do fer ya!! Ha! The above picture is an excerpt from a poem written by Jenny Joseph in 1961 when she was 29 years old. You really should read it all. This poem became Jenny’s most popular one even though she wrote all her life and won several awards and published numerous poetry books. Perhaps it gained popularity because it speaks of women doing what suits them instead of what others expect of them. A freeing thought to women of the 60s and continues to be even now. I’m older—I guess—and I enjoy wearing purple and many other colors. But how I most want to clothe myself is by wearing the honest, true version of my own essence. Not someone’s idea of who I am, not anyone’s opinion of how I should behave, and certainly not another person’s idea of what I should be. Who’s with me? Age has given me perspective and wisdom. Navigating through difficult times—suffering because of wrong choices, persevering through grief, loss, and change—as well as experiencing wonderful and joyful things like parenthood and being loved, will do that for you. Age has given me guts. Guts to break free and throw out all that isn’t truly my authentic self. Age has liberated me. I finally got tired enough to call it quits. I couldn’t take care of everyone else any more. I couldn’t be what “they” wanted and demanded. And good Lord, why should I be? How does allowing someone else to frame my character, personality, and behaviors honor myself or my Creator? As with most of us, the reduction and dismissal of my true self started at an early age when I began believing lies about myself. Experiences in my young life caused me to feel “less than” and that was the filter I used to interpret what people said about me. I heard words and perceived behaviors that convinced me I was, indeed, less than I should be. For the record, when we hear something, we must accept it and agree with it before it can become truth to us. How we feel about ourselves, often determined early in our lives, affects that. As I got older and began to dismiss other’s opinions and expectations, and tasted the freedom of determining my authentic self, I’ve discovered lots of treasures in my character. I’m not really those awful things people said about me. I know that they were lies. And I’m fervently hoping that you, too, will make the same discovery of truth. So what about that purple? Please wear whatever colors make you feel alive and vibrant! But, most importantly, clothe yourself in the dazzling radiance of your perfectly true self. And, darling, won’t we SHINE!! Women need a tribe because we crave those who will listen to, support, and encourage us. We do those things for many other people, and sometimes we become resentful if we aren’t allowed the same privilege. There’s freedom and strength in having friends who listen to you, allow you to voice your dreams without stifling them, and encourage you to be your best–whatever that looks like. If you don’t have a group of friends, or at least one special friend, I encourage you to seek out people you relate to, who share your spark and interests, and who will honor and treasure you. Perhaps you will find these friends in an online group, a club friendship, or co-workers. I found a tribe like this in an online group called Women On Fire. I also love the Women2Women community and have found my tribe here. Finding your tribe takes being open to making friends, cultivating relationships, and seeking ways to meet other women of like mind and heart. If you are determined to find your tribe, you will. You are fabulous!! Don’t believe it? Maybe you should change your self-view. For you to be your most authentic and confident self, you need to love and value the person you are. Take inventory of and celebrate your strengths and skills (ask a friend for help if needed). Declare yourself amazing and delightful and strong! Make life happen for you. Remember, although you are a queen worthy of a crown, you are also a warrior woman with killer stompin’ boots. So eat the cookie, already. Buy those flowers, soak in the tub, and take a nap! Women are characteristically nurturing souls. But who nurtures us? Most likely no one. It’s up to us to nurture ourselves and that means self-care; giving yourself permission to do the little things that restore your joy, your health, and your energy. Here’s to living your life so that your sparkle shines for the entire world to see. As a contributing writer to the Women 2 Women Michigan magazine, I wrote this for my “Sparkle & Shine” column in their first 2017 issue. You can read the whole issue for free here. You will most likely enjoy the magazine because it’s full of great articles and information for, about, and by women. In a cute gift bag place the card, a Dollar Store tiara (from the kids’ party section), and a shrink-wrapped cookie (the kind you find at Starbucks). Or something like that. This gift has made many women smile! Enjoy your week, my friends! Do You Love Your Child “Every Single Bit”? I designed this card to express how I feel about my children. How about saying these words to your own children? Help them feel like precious treasures. Because when children know that they are amazing and wonderful and CHERISHED, they have a healthy foundation for self-love and courage, and know that they have a safe place supporting them. On the other hand, please don’t let your child hear that they were a surprise, or a mistake, or an “oopsie”. Those words can damage for life. If you were blessed with a child, however that happened, they are a treasure to be cherished. Am I always diligent about letting my children know I love them, every single bit? No, of course not! I make mistakes, lose my temper, say things I shouldn’t. But I really try. I want them to know the gift they are to me. Side note: Does that mean always sacrificing MY needs for theirs? No. I believe that always making them a priority, even over my own needs, teaches entitlement and expectation that the world will revolve around them, which we all know is not true. I model healthy self-love by taking time for myself and doing things that help replenish my spirit and restore my brain so I CAN take care of them better. So, my friends, won’t you join with me in telling your children that you love them, “every single bit”? Have a great day, folks!! Last month I was interviewed by HerIdeaBlog.com. They feature creative women each week and I was very excited to participate in this. I have put my interview below, but be sure to go to the website to read about more amazing women! In describing myself, I’ll borrow from one of my cards that says, “Live Loud”. I believe that we should live our life with intention and grab it with both hands, living with gusto. I call myself “The Queen of Sparkle and Shine” because I’m passionate about sharing truth, encouragement, shining my light, and giving big sparkle hugs. I’m often seen wearing a tiara (I’m Queen after all). I’m a retired elementary school teacher and I’ve already enjoyed a lot of living in my years. Currently I am the only parent of two teens, I teach reading to kindergartners who were ill-prepared to enter school, I’m writing my first book, I’m a blogger and Instagram “encourager” shining my light and truth to uplift others, I’m a bi-monthly contributor to the Women2Women Michigan magazine, and the owner/designer of Empowordment Cards by Mimi. I’m also an inspirational speaker. My business is called Passionista At Large, which is the “umbrella” for all my other interests. 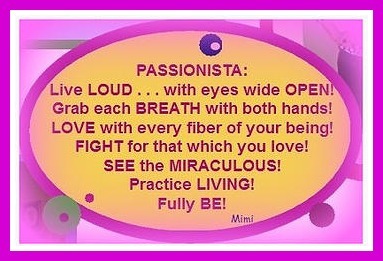 “Passionista” describes my zest for living and my intense desire to share with individuals how they can rise above negative beliefs to be empowered for making positive choices in their lives. The “at large” part is a way of poking fun at myself, as I am 5’10” tall. When I was teaching I’d refer to myself as large and in charge. But it also means that I’m on the prowl to Inform, Inspire, and Ignite. Everything I learned on my journey to self-empowerment I long to share with others. Tell us a little bit about your Etsy shop. Words are absolutely powerful–whether spoken, written, read, or heard in our minds. I have found that having a visual reminder of truth helps us to focus on that truth. And that is how my EmPOWordment Cards began. I wanted cards that would uplift and build self-esteem by providing affirmations and positive words to live by. Two years ago when I started designing cards, I knew nothing about Etsy and Instagram or all the quotes that are so prevalent now, so was completely pulling from my own creativity and experiences. Memes had just become popular, and I’d been designing them for my blog posts. My sister commented that I should make them into cards to sell. I wasn’t really sure about that idea, but because I wanted something to take to speaking engagements, and give out to others, I began to design cards to empower and build self-esteem—with words—thus the name EmpoWORDment. I was a novice designer, using PicMonkey to create backgrounds and designs to showcase the all-important words. Many of my cards reflect my own journey. For example, “Don’t Let Anyone Ever Dull Your Sparkle” is very meaningful to me because for most of my life I allowed others to control and dim me. “I Was Born To Shine” is something I realized only a few years ago, and now I purposely tell everyone that we all have a unique light to shine in this world. I had just designed “Queen of Courage” when my sister was diagnosed with cancer. I dedicated that card to her. Every card has a personal meaning (and story) for me. I truly love designing, and soon branched out into mugs, journals, note cards, a cute card deck that can be made into a garland, and this year I created a Sparkle & Shine calendar. It has monthly affirmations that are to be repeated every day of the month. Doing so will change your thoughts and help to create positive energy in your life. My designs are colorful and sometimes quirky. They capture attention. They provide others with encouragement, self-esteem boosters, empowering words, and positivity. They often create emotion, because words ARE powerful! Empowerment to me means living fully as your authentic self, free from self-limiting beliefs that control your behavior and hold you back. Empowerment can be a huge deal like the women’s march, or small, personal steps toward freedom. My own empowerment began when I realized I’d believed lies about myself all my life. I believed that I was too emotional, not very smart, not worthy of love, was broken and unlovely, to name a few. One day, in an act of courage and boldness, I finally told the lies in my head to “shut up!” and began purposely replacing them with what I call truths. If you care to read about that, go to https://particularpassions.me/2016/04/05/the-lies-that-bind-us/. The truths I began saying to myself are universal: I am enough, I am creative, I am amazing, I am powerful and strong, I deserve good things in life, and I am loveable. Our brains are quite amazing, and even if we don’t believe these words at first, when repeated often, our brain will begin to store them as part of our belief system. And that’s what happened to me! It sounds very simple, but it took me several years to get there. All of my life I’ve been in love with words. A person can create visual images, emotions, and life and death, with words. The lies I’d been allowing to blow through my brain had been creating death to who I was created to be. When I began believing and acting upon the new truths, I became a powerful force to be reckoned with! I can now shine my light with purpose. And I know that I am “Amazing With A Side of Sprinkles”! What is a quote that has inspired you lately and why? Asking me, someone whose business is designed around quotes, to pick out a favorite quote is pretty tough. But I will tell you the one that has guided me for these last six years. “Don’t tell me the sky is the limit when there are footprints on the moon!” by Buzz Aldrin, one of the first astronauts on the moon. This speaks to me about not being limited. About doing those things I might think are impossible or out of my reach. And it says that there are amazing opportunities that I don’t see yet, just waiting for me. If you could spend a day with any creative woman, who would you choose and why? respect for their abilities, their hearts, and their authenticity. Sue Monk Kidd, a favorite author, wrote a book that transformed my life. Maya Angelou inspires me with her guts, strength, passion, and incredible ability with words. Meryl Streep continues to amaze me with her acting ability, her humor, her ability to embrace aging, and her love and compassion. Carole King began my journey of poetry set to music and she continues strong. See? There are so many. And what a conference THAT would be!! What are some of your other creative interests? I enjoy many other creative activities besides designing and writing. I love gardening and creating beautiful flowerbeds from which I can make “yard gatherings” bouquets. I write poetry. I sing. I paint on rocks. I sew. I have created a lovely home. I create memories for my children, through camping especially, and travel. What do you enjoy most about being a creative woman? What I enjoy most about being a creative woman is that days are never, ever boring! There is always something new to learn and try. I feel resourceful and I’m very grateful for the abilities that are mine. I try not to take them for granted, but use my gifts for the betterment of others. And I suppose that is one of the things I love most about being creative—I can help others see truth and become empowered. And I pray that as the creative force flows through me it will pour out onto others in a way that positively affects their lives. Most of the cards shown above are available in my Etsy shop. The link is below.